Home » brewing sake » sake and nomi sugi. 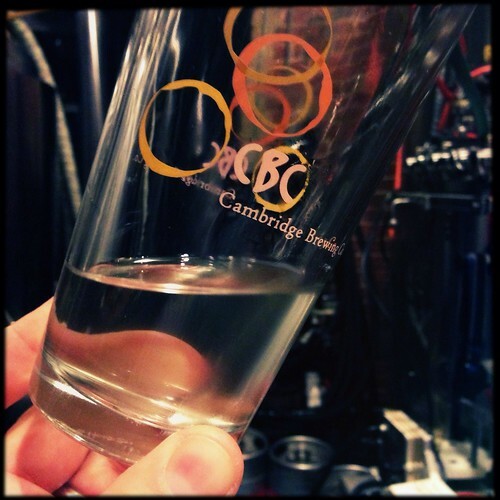 september 11 2013. cambridge brewing co.
sake and nomi sugi. september 11 2013. cambridge brewing co. The fall brings with it cool, crisp nights that we all enjoy. It is during this time that our drinking and food choices start to change, not quite to rich winter foods, but to earthier and heavier food and drink to pair with the weather. Seasonal Sake choices are no different; heavier, earthy Sake at warmer temperatures get more popular as the weather gets colder. 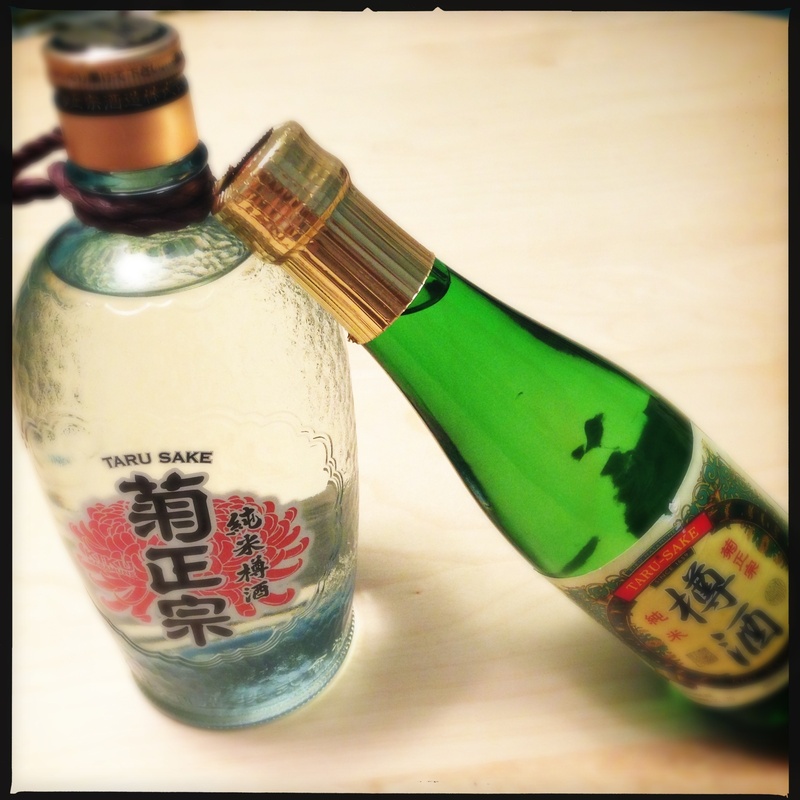 One of the Sake styles you might see in the fall is Taru Sake. “Taru” means barrel, and this Sake is a throw back to an age where all Sake was fermented and served from wood vessels. While European countries preferred oak for this task, the Japanese preference was for a readily available, light weight, rot resistant, and locally grown wood: Sugi. Sugi is a unique tree, with only one species in its genetic group, Cryptomeria Japonica. In addition to the aforementioned properties, it is also highly aromatic. Often called “Japanese cedar” (although not in the Cedrus group of trees), its aroma is complex with notes of pepper, sandalwood, cedar, and frankincense. 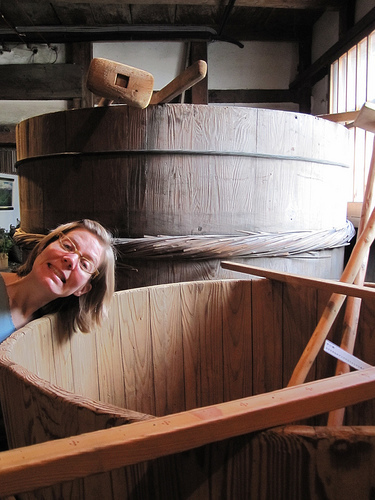 Since a lot of the equipment in a Sake brewery, from tanks to barrels to stirring paddles, was made of Sugi, all of the Sake in historic Japan was highly aromatic. Now with the pervasiveness of food grade plastics and steel, most Sake has lost that wood character; however breweries still make a Sake that is aged with chips of Sugi wood to impart that unique aroma despite the steel tank. We used that technique to wood age a quantity of our Sake/beer hybrid Banryu-Ichi to give it an earthier flavor and rounder mouth feel. Now that we are sold out of Banryu-Ichi, and the weather has turned to fall, it is time to announce the tapping of our Sugi-aged beer and the last of our Sake! Nomi Sugi (飲み杉): Our Sake/Beer hybrid aged on Sugi wood. This unique beverage combines the best of both Sake brewing and beer brewing with complex aromas and flavors, including sweet rice, fresh apples and wine grapes, hints of earth and mushroom from the koji, and spicy wood notes of sandalwood and cedar from the Sugi. As it warms further notes of fennel, herbs, and an almost Belgian-yeast spiciness. Brilliant copper-colored, it is full in body despite its very dry finish. 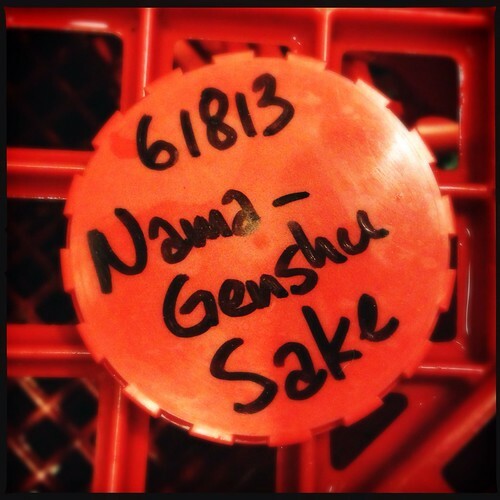 Junmai Nama Genshu (純米生原酒): The last of the Sake that we set aside from making Banryu-Ichi. Recently we tapped some kegs of our unfiltered version and it sold out in 4 days. Now we are tapping the highest expression of our Sake brewing project – filtered, unpasteurized, full strength Sake and we do not expect it to last long! This year we used 2 different Sake yeasts to give a greater complexity to the fermentation. Bright with aromas of cotton candy, white grape, and apples and flavors of rice, melon, pineapple, and rice. For more information on this years brewing, check out my previous blog post. Traditionally Sake brewing happens in the winter and after a period of aging in the tank the new Sake is released in the autumn. Our Sake is a true hiya-oroshi (ひやおろし) Sake – less pasteurized and released fresh in the fall. Most commercial Sake would undergo pasteurization in the bottle and other methods to stabilize the flavor for sale. Please join us the week of the 11th for this unique experience. Like the beautiful autumn leaves of New England, our hiya-oroshi offering will be a true seasonal delight but will be gone too quickly.